Metro concept for crossing 1st St. and Alameda Street in the Little Tokyo/Arts District. If you’ve been following progress on the Regional Connector project, you already know that the Little Tokyo community has not exactly been thrilled with Metro’s proposals to build rails at street level across First and Alameda Streets to connect with the Gold Line. The Little Tokyo Community Council has, in fact, voted to oppose both of the agency’s build alternatives until the agency revisits how to best cross this critical intersection with the least impact to the integrity of Little Tokyo. During the Alternatives Analysis, Metro identified and analyzed over 33 different alternatives to close the 1.8 mile gap. Two of the final eight alternatives did cross the intersection underground but due to comments received from the community regarding concerns about impacting the Little Tokyo/Arts District Station, the Nishi Hongwanji Temple and the potential Nikkei development anticipated to be in construction prior to the Regional Connector, these two alternatives were not pursued further. In recent weeks, the City-selected developer of the proposed Nikkei development indicated a willingness to look at utilizing the site in combination with the development. In response to the developers position and community concerns, Metro revisited the earlier alternatives and devised a new fully underground concept that they will present tonight at a meeting with the Little Tokyo Working Group. It is important to note that the concept is just that — a concept — and the decision has not yet been made to add it for evaluation in the current draft environmental impact statement and report that is underway. The alignment is generally the same as the current Underground Emphasis alternative, which proposed to have trains cross at current street level — with a new underpass for truck traffic being built for Alameda — and then enter a tunnel on the west side of Alameda. The tracks would continue underground to Metro Center at 7th and Figueroa/Flower. The point of this exercise: to tie together the Blue Line, Expo Line and both legs of the Gold Line so that passengers on all four lines can ride a single train — no transfers necessary — through the heart of downtown L.A. The new concept, as the above map shows, has the Gold Line entering tunnels on the east side of Alameda and then stopping at an underground Little Tokyo/Arts District station to accommodate Regional Connector trains. That would bring to four the total number of stations on an underground alignment of the regional connector. 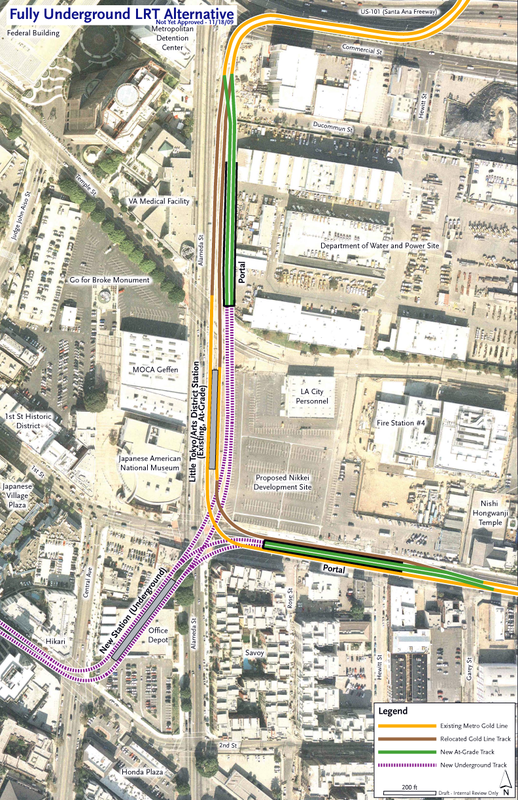 One tunnel portal on 1st Street would allow a connection to the Metro Gold Line Eastside Extension, requiring the street to be widened on the north side between Alameda and just east of Hewitt. The second portal would be built along the eastside of the Gold Line tracks to Pasadena, allowing for a connection to the tracks to Union Station and, beyond, the Gold Line to Pasadena. 1. It will add cost to the project because of the fourth station and additional portal. The underground-emphasis alternative of the regional connector — which seems to be favored by many downtown community members — already is estimated at costing $910 million in 2008 dollars. The project is set to open in 2019, under the long-range plan recently adopted by the Metro Board of Directors. 2. It also means that Metro would likely have to acquire some property east of Little Tokyo/Arts District Station and tracks to Pasadena and on the northern side of 1st Street. It is important to note that Metro Regional Connector officials have already met with the Nishi Hongwanji Temple on 1st Street and assured them that they are currently not impacted by the new proposal. They were already impacted by Eastside Gold Line construction due to street widening on 1st Street. 3. The newly installed traffic signal at 1st and Hewitt Street would be eliminated and cars would not be able to cross 1st Street at that location. 4. Metro will have likely have to purchase more property in order to build a new underground station in the Office Depot site. This will be determined after continued study. Metro will continue to refine this concept in the coming months — based in large part on the reception it gets in the community. All environmental issues will be analyzed and discussed in the Draft EIS/EIR anticipated for release end of summer/early Fall of next year. Official public comments on the project will be recorded at that time, however Metro will continue to receive all comments on the project. To comment on this concept, click here.